The Mint of Finland will issue a new coin dedicated to “Children and Creativity”, which was designed by a member of the public. With more than one thousand votes cast, 17 year old Roope Määttä’s design was the winning entry. 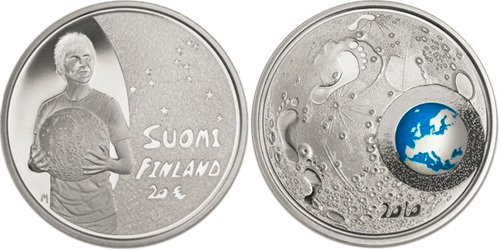 This is the first time a Finnish collector coin has been selected by a popular vote. Visitors to the Mint’s website had the opportunity to vote for their favorite among 11 entries which were submitted by students at senior secondary schools specializing in arts. The coin, entitled “Beyond this Horizon”, captures the moment when the seemingly impossible has been achieved and sights have been set on the next challenge. “My work also symbolizes the idea that it’s important to remember your roots,” Määttä said. The coin will be struck in time for its general sale to collectors on the October 20, 2010. The nominal face value is 20 Euros, and coins struck in .925 silver, with a weight of 33.6 grams and a diameter of 38.6 mm. Both proof (10,000 examples) and FDC (3,500 examples) will be available. The coin represents the second issue in the “Ethical Collector Coins” series. The first coin in the series, entitled “Peace and Security”, was issued in 2009.